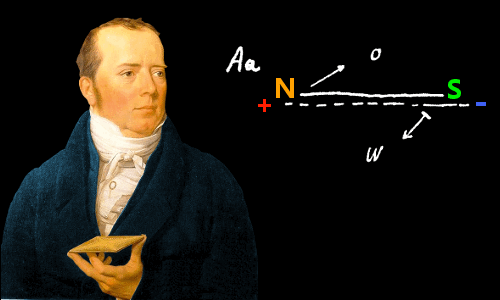 Hans Christian Oersted began a new scientific epoch when he discovered that electricity and magnetism are linked. He showed by experiment that an electric current flowing through a wire could move a nearby magnet. The discovery of electromagnetism set the stage for the eventual development of our modern technology-based world. Oersted also discovered the chemical compound piperine and achieved the first isolation of the element aluminum. Hans Christian Oersted (Ørsted in Danish) was born in the small town of Rudkøbing on the island of Langeland, Denmark, on August 14, 1777. His father was Soeren Christian Oersted, a pharmacist, and his mother was Karen Hermandsen. Hans and his younger brother Anders were educated through a combination of home schooling and private tutors – a German wigmaker taught the brothers to speak fluent German. Anders became Denmark’s Prime Minister. At age 12, Hans started helping in his father’s pharmacy and became interested in chemistry. At age 16, he passed the University of Copenhagen’s entrance exam. At age 19, in 1796, he graduated with a degree in pharmacology. At age 22, in 1799, he graduated with a Ph.D. Today most awards of Ph.D. (Doctor of Philosophy) are not made for researching philosophy, but Hans Christian Oersted’s was – Immanuel Kant’s philosophy of nature. As we’ll see, this helped shape his view of the world. 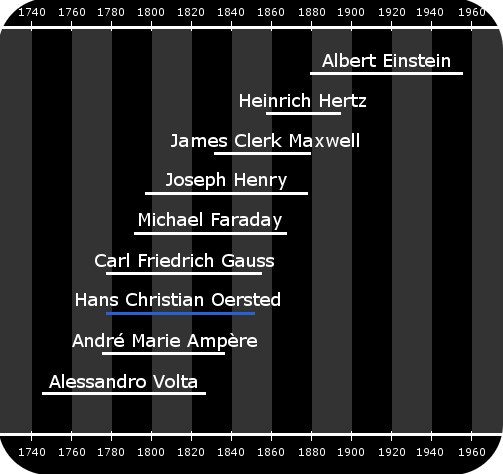 Oersted’s lifetime and the lifetimes of related scientists and mathematicians. By the year 1800 Oersted was a pharmacy manager. In this year a scientific revolution began. Alessandro Volta announced details of his battery, opening new territory for chemists and physicists: Volta’s battery enabled them to produce a steady flow of electricity for the first time and, happily, the materials needed to build one were easily obtained. Oersted dived into the new science and, in 1801, published a scientific paper describing a new battery he had invented. He also described how to calculate the amount of electric current flowing by measuring the rate of gas production when electricity split water into hydrogen and oxygen. The Danish government funded Oersted to further his education in other European countries – he spent the years 1801 to 1803 in Germany and France. In Germany he became influenced by the ideas of the philosopher Friedrich Schelling who believed all of nature was unified. Rather grandly, Schelling believed scientists should strive to find the theory underlying all of nature rather than using experiments to study isolated parts of nature. Oersted absorbed much of Schelling’s philosophy of science, but disagreed with his disdain for experimental work – as a pharmacist Oersted had learned how powerful a tool experimentation could be. However, he shared Schelling’s enthusiasm for the unity of nature. In the German city of Jena, Oersted met and befriended the German physicist Johann Wilhelm Ritter. They shared a common interest in electricity. Ritter was also enthusiastic about Schelling’s philosophy of an underlying harmony of nature – in particular he was convinced that electricity and magnetism were closely linked. After he returned from his travels, the Danish government funded Oersted to continue his research work. In 1806, age 29, he became a professor of physics at the University of Copenhagen. He was an excellent lecturer and students flocked to his classes. Sometimes he lectured for as many as five hours a day – a very heavy load. In addition to lecturing he established physics and chemistry laboratories for research and teaching. Oersted’s famous experiment showing that electricity and magnetism are linked, took place during a lecture on April 21, 1820, when Oersted was 42 years old. In the experiment he passed electric current through a wire, which caused a nearby magnetic compass needle to move. Oersted holds a wire above a magnetic needle supported on a pivot. The needle is deflected when electric current flows through the wire. Oersted’s original notes. He shows how an electric current flowing in a wire causes a nearby magnetized compass needle to turn. Over the next few months Oersted carried out more experiments, discovering that electric current produces a circular magnetic effect around it. 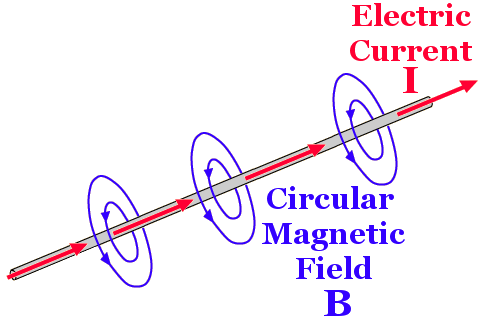 Oersted showed that electric current produces a circular magnetic effect around it. Oersted announced his discovery on July 21, 1820, in a paper consisting of four pages of Latin, which was soon translated into most of the main European languages. Oersted’s English paper had the title Experiments on the Effect of a Current of Electricity on the Magnetic Needle. By September 1820 François Arago was demonstrating the electromagnetic effect to France’s scientific elite at the French Academy, which almost immediately led André-Marie Ampère to take the next steps in the story of electromagnetism. Just as Volta’s invention of the battery had opened new horizons in physics and chemistry, Oersted’s discovery of a link between electricity and magnetism unleashed a revolution in physics leading us into our current digital world. The British Royal Society awarded Oersted the 1820 Copley Medal, the greatest prize in science, for his discovery of electromagnetism. Previous prize winners included Benjamin Franklin and Alessandro Volta. The French Academy sent Oersted 3000 gold francs. It is sometimes claimed electromagnetism was actually discovered by Italian jurist (and physics enthusiast) Gian Domenico Romagnosi. In 1802, two Italian newspapers carried accounts from Romagnosi of a magnetic needle deflecting near a battery he built. 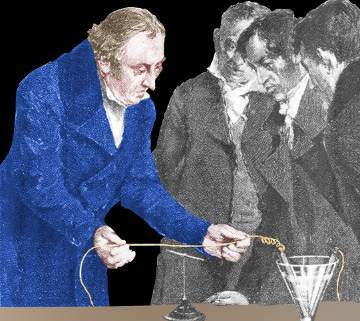 Today, looking at his method, it is clear Romagnosi’s experiment did not involve a complete electric circuit, so electric current could not have flowed. Without current, there can have been no electromagnetic effect. The needle in Romagnosi’s experiment was probably deflected by a build-up of static electric charges on the needle, which moved as a result of the mutual repulsion of alike electric charges. Although a professor of physics, Oersted, with his pharmacological background, was drawn to chemistry. At first he rejected Antoine Lavoisier’s concept of using the chemical elements as a means of rationalizing and understanding chemistry. Oersted wanted something more in harmony with the ‘everything should be governed by a single law of nature’ ideas of Friedrich Schelling. He also sought to anchor chemistry in the ideas of philosopher Immanuel Kant, whose work he had studied enthusiastically for his doctoral thesis. Kant believed matter could be divided infinitely (i.e. there were no atoms) and that all matter was constructed from two fundamental, opposing forces, which were in equilibrium with one another. For a time this led the young Professor Oersted to promote the fanciful theories of the Hungarian chemist Jakob Joseph Winterl, who believed all of chemistry could be understood by the opposing forces of two substances – Andronia (the principle of acidity) and Thelycke (the principle of alkalinity). Winterl believed these substances were more fundamental than the elements. However, Andronia and Thelycke turned out not to exist. After abandoning his adherence to Winterl’s ideas, Oersted made a number of important contributions to chemistry. In 1819, he discovered piperine, the chemical compound responsible for the strong, sharp flavor of black pepper. a lump of metal which in color and luster somewhat resembles tin. He produced aluminum by reducing aluminum chloride with a potassium-mercury amalgam. Today, when we hear the words Thought Experiment, we often think of Albert Einstein’s famous thought experiments which guided him towards his theories of relativity. A thought experiment consists of asking “what if…?” and then logically thinking through the consequences. Oersted was actually the first person to use the German term made famous by Einsten: Gedankenexperiment. Hans Christian Oersted became great friends with the Danish writer Hans Christian Anderson before the writer became famous. Oersted became a champion for Anderson’s fairy tales, helping to get them published in 1835. In 1814, Oersted married Inger Birgitte Ballum, the daughter of a pastor, and in the following years the couple had three sons and four daughters. Hans Christian Oersted died age 73 on March 9, 1851, in Copenhagen after a short illness. He was buried in the Assistens Cemetery in the Copenhagen suburb of Noerrebro. This is also the final resting place of the physicist Niels Bohr, writer Hans Christian Andersen, and philosopher Soeren Kierkegaard. "Hans Christian Oersted." Famous Scientists. famousscientists.org. 26 Sep. 2015. Web.